Toothaches and headaches and flu...oh my! It's been awfully quiet here these last few weeks. We spent two weeks in Florida while Niels attended back to back conferences. The day after we got home, I got hit by a monster flu strain that has keep me dazed and confused for the last week and a half. And, while on vacation, I lost a filling, so have been dealing with a toothache for the last few weeks. Today, I'm finally well enough to get my tooth fixed, and the fog is finally lifting off my brain so hopefully we'll get back on track here. If you've been following our blog for awhile, you may recall that I live with a brain injury. I'm very blessed that I am a high-functioning brain injury survivor. If you met me on the street, you wouldn't even know that I have a brain injury. One, because I don't look like I have a brain injury. And two, because the fact that I'm out means I'm having a good day. One bad days, I don't leave the house. On really bad days, I don't leave my bed. It's been nine years since I've sustained my brain injury and all my months of therapy are over. I have regained as much as I will get back. For the rest, I have an excellent support system (hello, Niels!) and finely tuned coping mechanisms. For the most part, I know what situations to avoid, and I know to listen to Niels when he sees that I am getting symptomatic (showing signs that my brain is overloaded). It's taken a long time to get to this point and even still there are times when I push myself too hard and pay for it by having a few weeks where I'm just getting by until my brain recovers. I will never been a super consistent blogger because a brain-injured brain doesn't like deadlines and can't promise consistency. When I am feeling good and all my neurons are playing nicely, I love to share what I'm working on. But there will be times when I can't form a sentence and my brain is muddled, and then I will let myself rest. I think all of us have our own tenderheartedness toward events and experiences that hit close to home. I think of a friend who is tireless in her work to raise money and support for breast cancer research after losing a friend to the disease. When we become parents, we can't help but hold our little ones closer when a fellow parent loses a child. For those of us whose wombs have not been a welcoming home for little lives, we easily weep with those whose empty arms ache to hold a child. Compassion stems from empathy, and I empathize with those who are affected by brain injury, children whose parents divorce, and couples for whom pregnancy is difficult. This little reflective prose was sparked by the news that a friend of mine from Grand Rapids (where I lived for 8 years before moving to Ohio to get married) is in the hospital with a ruptured brain aneurysm. I know that there is little I can do for her and her family right now, but I hate that I'm too far away to give them the hugs I long to offer. She is headed into surgery in a few minutes and I am praying fervently for her medical team and God's healing hand. Amy is one half of the most inspirational married couple I know. She and her husband, Tim were part of the Bible study I was in for several years following after my brain injury. In 2005, I wrote this post about them on my old blog. I'm at an age where I've been to more than my share of weddings, and truthfully, I'm also at that age where I can be more cynical than celebratory. Reminds me of the old Friends episode, "I'm totally happy for you...well maybe, mostly happy and a teeny bit jealous...okay, mostly jealous, but still happy." Most the weddings I've attended this year have been for couples a decade younger than me. When I was their age I thought it was crazy to get married so young. I wanted to get out there and establish myself as Miss Independent first. Well, I did that and now the pickins have definitely slimmed. From this side of things, I can appreciate the beauty and blessing of struggling together in those transitional 20s. This weekend I attended the wedding of a couple who married in their 20s...in the 80s. It was actually a recommitment ceremony and it will stand as one of the most emotional, memorable weddings, if not experiences, of my life. This couple is part of my much-loved intergenerational small group. It has been an answer to prayer to find a few other people from different walks of life to share life with. (Side note: We first got together as part of our church's 40 Days of Purpose campaign and dubbed ourselves The Zeros because as a group, grace didn't rank very high on our giftedness. This weekend we realized how much God has taught us. Each family has faced a significant crisis since joining our group). Last October, it looked like these two were going to divorce. The wife shared that she felt like their marriage was a Jenga game knocked over one too many times. She was staring at all the pieces and didn't have the desire or strength to put them together again. As a two-time child of divorce, it's very hard for me to hear this sort of thing because I know that divorce rarely solves problems. Couples who fight before they divorce fight after the divorce, whenever children are involved. So I sat and listened and God gave me a thought. The next day I went to Meijer and bought a Jenga game...and a big ol' tube of Super Glue. I wrote a note to my friend saying something to the effect that she doesn't have the strength or desire to repair her marriage, which makes her ready to let God be the glue of their relationship. 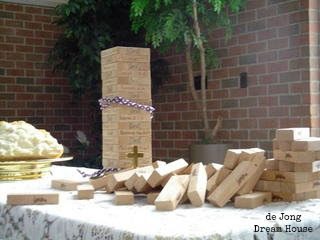 At the wedding, this couple had a Jenga tower next to the communion elements. When they addressed the small group of us assembled, the husband and wife shared the litany of things God did to show them how the only one happy when a couple divorces is Satan. They shared the things that brought instability to their marriage and in one sweeping swoop knocked over the Jenga pieces. After a moment of letting that image sink in, they pulled out the Jenga tower I gave them. It was super glued together and they had written "Christ" on the center blocks, and Scripture and situations on the long pieces that described the process of rebuilding--everything from a marriage class they took to our small group. Then they took a three-strand cord and wrapped it around the tower. That's just one example of the symbolism of this ceremony, and the most personal to me, but the whole event created such an amazingly wonderful demonstration of the choice to love...and to keep loving. For our small group, it was incredibly powerful to revisit all those moments that we shared that led this much-loved couple to reconcile. For me, as the token single, it was a healing affirmation that God sometimes uses us best in the areas where we are weakest and can do nothing but trust Him to lead us on. Amy and Tim have a long, hard road ahead of them. I pray for healing for Amy. I am praying that this woman, wife, mother, teacher, and friend will recover her personality and abilities and come to love--as I have--life in the slow lane, for however long she's riding in it. I pray that she can remember her value in who she is, simply because of who she is, and not because of what she can or cannot do. I am praying for her husband because I think brain injury is in some ways harder for the spouse who remembers more than the survivor. For Tim, I am praying strength as he makes decisions for Amy, as he watches her struggle, and he pushes and supports her to make strides in her recover. I am praying that he is able to love Amy with an utterly selfless love, and remain consistent in that love regardless of how Amy is able to respond in the weeks and months ahead. I also pray protection for them both. It's easy to get overwhelmed by the work to be done, depressed by the slow progress, and grief-stricken by the losses. I know how pervasive the temptation is to fall into self-pity. I pray that the challenges ahead draw them closer and do not form a wedge. I pray that this is just the next chapter in their amazing love story.